One of the problems with visual programming languages is layout – you can stay endless hours just arranging the figures in the diagram without any real changes in the program, just to “make it look better”. This is a complete waste of time. For textual languages, it is a standard practice to have code auto-formatters that format the code every time you save. There are even some extremists who consider badly formatted code as having errors (if you are interested in the subject, there are programs like CheckStyle and Sonar to check coding standards, among others. If you use a good another tool and find it helpful, please leave me a note). 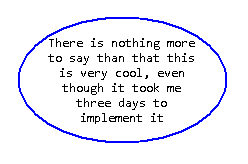 So the developer has a problem – he has to decide how to resize his ellipse in the “best way” possible (which will definitely be different from the “best way” of all other programmers). My solution: don’t let the programmer decide (at least not directly), but have each model element decide on its size, based on pre-defined configuration. It took me some days to get this to work, and I had to dig and debug the GEF Logic example a couple of times, but finally I managed. I needed to do the following things: 1. calculate how large is the text; 2. calculate the desired width of the the text using a pre-determined width to height ratio (See my question on ux stackexchange regarding this ration); and 3. calculate the final size of the text after resizing it to the calculated width. The last step is needed because the text may actually end narrower because we only want to have new lines when there is a break in the text (spaces, commas, etc.). Draw2d has a component that knows how to do this (called TextFlow) but I couldn’t manage to find a way to calculate the height… I tried to use getPreferredSize() on the TextFlow after setting its size, bounds, etc, but didn’t work. And then I found it: I had to pass -1 as the desired height to the getPreferredSize() method so it calculated it alone! * using a provided width to height ratio. *          ratio to use when calculating the smart size of the label. * Calculate the best size for this label using the class's width to height ratio. * height using line breaks. *         the required width to height ratio. more about this in a future post). So there it is, now the programmer can’t resize the figures, not matter how hard he tries. And the size is calculated automatically. The code for this class (and more goodies to come) can be found here and my new jdraw2d library (in progress) can be found here. invalidate() clears this cache. The code was updated to mach this. ← Achieved 3K Reputation on SO! Please, make a tutorial for nodes with labels outside of nodes. I.e. OPMObject with label under or over it. Have a node figure with two internal figures: one the label and the other one the text. In this case you have one edit part that is completely selectable and the text and node move together. Create three edit parts, one that is imply a container, one for the node, and another one for the text. In this case you can move the parts independently, but requires a lot more code. If you have followed my tutorials, both implementation should be straightforward. He deployment in exercise this all page com.vainolo and running perfect. Sorry, but I could not understand your question. How can i change font size of textflow ? I tried with the method [textflow.setfont] before I had changed height value of fontdata. But that didn’t work correctly and made any space on head. No idea… never tried to do this. Did you try debugging the code to see what happens? You should also ask in StackOverflow. This is an eclipse plugin, so there is no main(). Start reading from the first tutorial and thing will surely become more clear.